The premise of the show began with the popularity of the Orlando, Florida local Crash-A-Rama series. The filming of the Test Drive: Eve of Destruction video game by Atari sparked the idea for the show. It all starts out with a challenge given at Orlando Speed World. Twelve Extreme racers must accept the challenge with a "very limited" budget, and build up their race vehicle before the 4 day deadline to "Race Day". The first six episodes were filmed as a pilot in 2004, and have grown in popularity as one of Spike TV's highest rated shows. Some of the races from season one include: Mini Van Reverse race, Flagpole race, Blind Fold race, Car Soccer, Automotive Roller Derby and an Ambulance chain race. 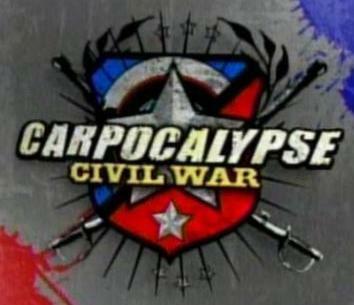 Carpocalypse : Civil War was the second season and final season. The show was taped in Orlando, Florida at Orlando Speed World and in Buffalo, New York at Holland Raceway. The show consisted of ten episodes with two races per episode. At the beginning of each episode the racers were told what vehicles they will be building and racing that week. The teams are divided up into two groups of five: Five competitors from the South, including participants from the original Carpocalypse, and five new competitors from the North in a re-creation of the tensions of the United States Civil War. Each week the teams would build vehicles to race per a set of rules not disclosed on the show. Most likely the rules were based on two things: The idea of the race and safety of the drivers. The first five shows were based in the South and then the group moved to the North for the final five episodes. The show was bounced around the Spike TV schedule; originally on Saturday nights, it was then moved to Sunday afternoon with the final two episodes being shown on the same Sunday, one in the morning and then the finale hours later in the afternoon.